Most used screens with actual highest light output. 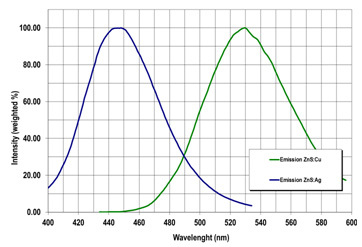 They are available with two different emission wavelength (blue or green), while the green emitting type matches very good with standard CCD-camera systems. 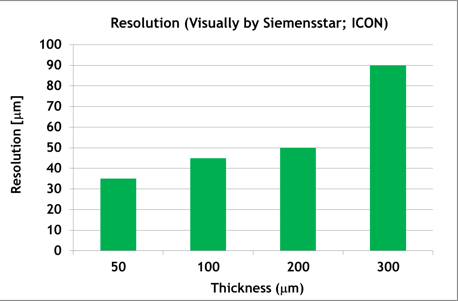 Due to the big range of available thicknesses (50 up to 400 μm) you are able to adjust the performance of the screen perfectly to your environment. (High light output or high resolution). 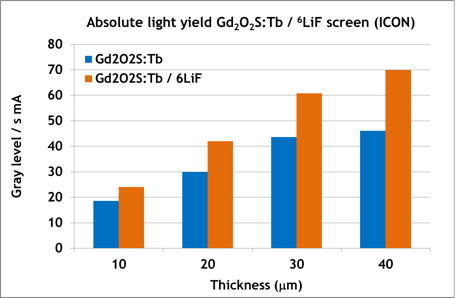 Due to strong bombardment of the light emitting phosphor by the secondary radiation generated by the absorbing atoms (6Li, 10B or Gd), the emission process gets damaged and thus, the light output is decreasing by longer use of the scintillation screen. Within a 2 years development project with the Paul-Scherrer Institute we were able to develop a new type of scintillation screen with an outstanding light output and significantly decreased degradation. 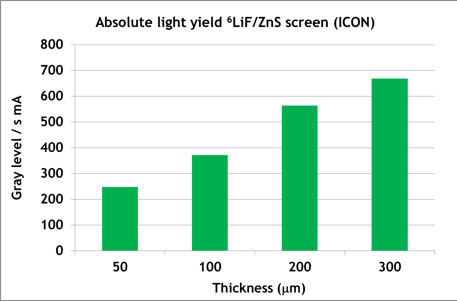 The new product shows in comparison to the still most used standard 6LiF/ZnS:Cu scintillation screen after some time a 50% increased light output! Especially for long term measurements the comparability is strongly improved! Due to the Cd content we have an increased neutron statistics and the emission with 604 nm is optimized to the sensitivity of a standard CCD-camera systems. 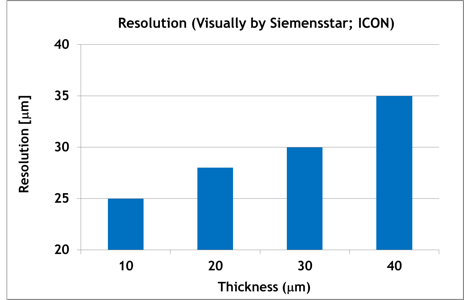 Scintillation screens for very high resolution measurements. 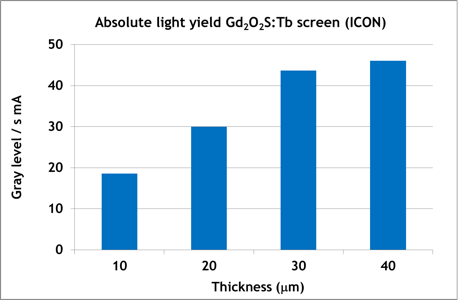 Gd has highest cross capture section to make scintillation thicknesses of 10 mm and below possible to reach highest possible resolution. 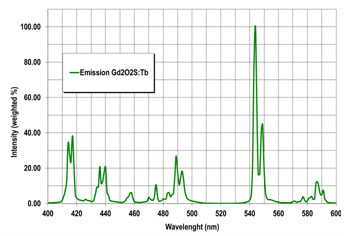 The emission maximum at 549 nm matches very good with standard CCD-Cameras. 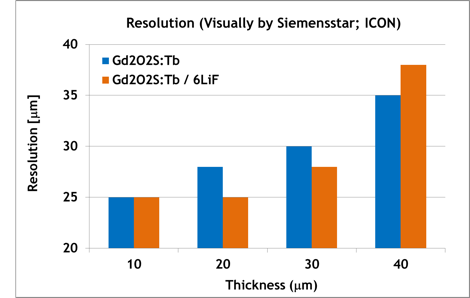 New development to increase the light output of the scintillator with still very high resolution. Emission maximum at 549 nm. The addition of 6LiF give a 30-50% higher brightness with same resolution! Typical scintillation screens for imaging with fast neutrons are ZnS filled PP plates. 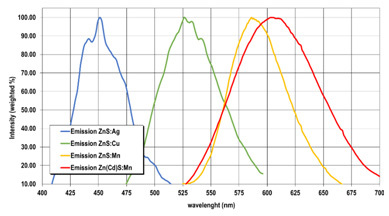 They are available with different emission wavelength (blue to orange), while the green to orange emitting types match very well with standard CCD-camera systems. Due to the big range of available thicknesses (1.5 to 3.0 mm) and sizes (up to 450 x 450 mm) you are able to adjust the performance of the screen perfectly to your environment. (High light output or high resolution). A good overview about the most important technical specifications is given in the publication from M. Makowska et al (J. Imaging 2017, 3, 60).